Ted Sickinger has the report here on PCC’s plan to borrow $200M to use to pay its PERS tab. The bonds will go on sale soon. While this is portrayed as a bet that stock-market returns will exceed the interest rates on the bonds (and it is) as Sickinger explains it also will give PCC access to some money up front and mitigate the effect of the PERS board’s obsessive desire to get PERS to 100% funding ASAP, regardless of what it costs current taxpayers, workers, and students. A more economically rational approach would be for PERS to convert to a partly-funded partly pay-as-you go pension scheme, and make it explicit that we expect that a more populous and richer future Oregon will have the resources to pay the retirement benefits of its workers. This is the decision that most other states have made, generally on a de facto basis. Of course such an approach is opposed by those who are impatient to shrink the size of government right now by increasing the cost of having state employees, and those who earn their living trading stocks and bonds on Wall Street. Unfortunately, it seems that PCC’s sensible workaround is unavailable to UO, because while PCC has its own PERS account, we are part of a larger state agency account. So UO’s current employees will continue to see downward pressure on their wages, and students will see higher tuition, as the cost of getting PERS to that magic 100% increases. A new analysis by The Oregonian shows that his pension windfall is not solely the product of his base salary from the university, which was a relatively modest $150,000 in 2005 and 2008 as head coach, and $299,999 as athletic director in 2009. Rather, it was inflated by endorsements by Nike and the Oregon Sports Network, ticket sales incentives and other perks, according to public records released to The Oregonian. Those are sweeteners few public employes get. And it’s a stretch to define some of it as pay from the state. 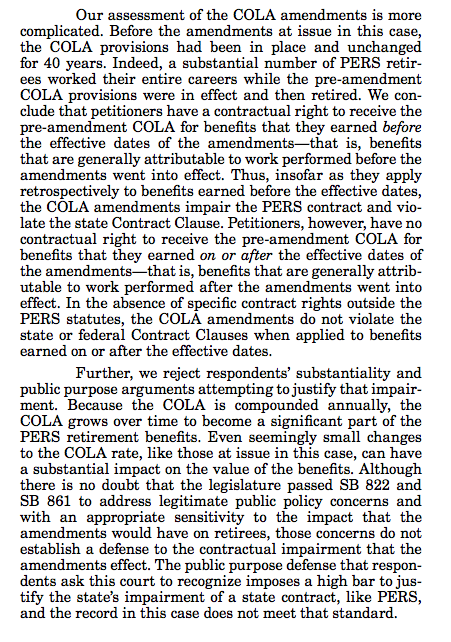 But it falls under the definition of PERS salary for pension calculations under Oregon law. 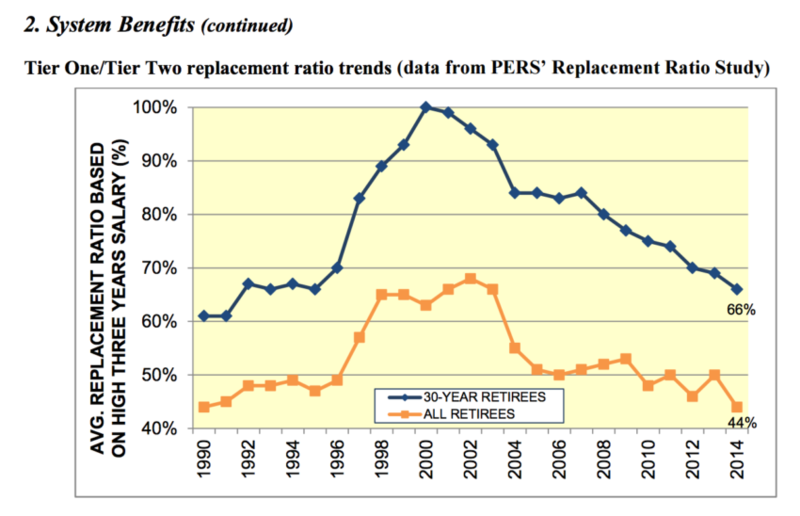 While Bellotti’s benefits are an outlier, they demonstrate how the mechanics of the PERS system can generate huge benefit flows for a fortunate few. They also show how PERS operated without any absolute cap on covered salary until 1996. And they illustrate how the burden of those benefits will be spread around the state for years. These payments were included in his PERS calculations even though UO and Nike never made PERS contributions from them. Nor does she discuss the main reason for the increases in the contributions the PERS Board is requiring from state and local governments and school boards: the Board’s insistence on moving as rapidly as possible to add ~$20B to its endowment and make PERS a fully funded pension system, instead of the leaving it as a partly “pay as you go” plan, like social security. There are economic arguments for fully-funded pensions, and for “pay-as-you-go” plans that use payments from current workers (or their employers) to pay the pensions of retired ones. Most states have made defacto decisions to go with a mix, with much smaller endowment funding than the 100% Oregon is shooting for. The average is 66%. Oregon is already above that. As the story points out, the money the PERS board is demanding from the state to get to 100% has many negative consequences for Oregon. So who will benefit from increasing the PERS endowment? 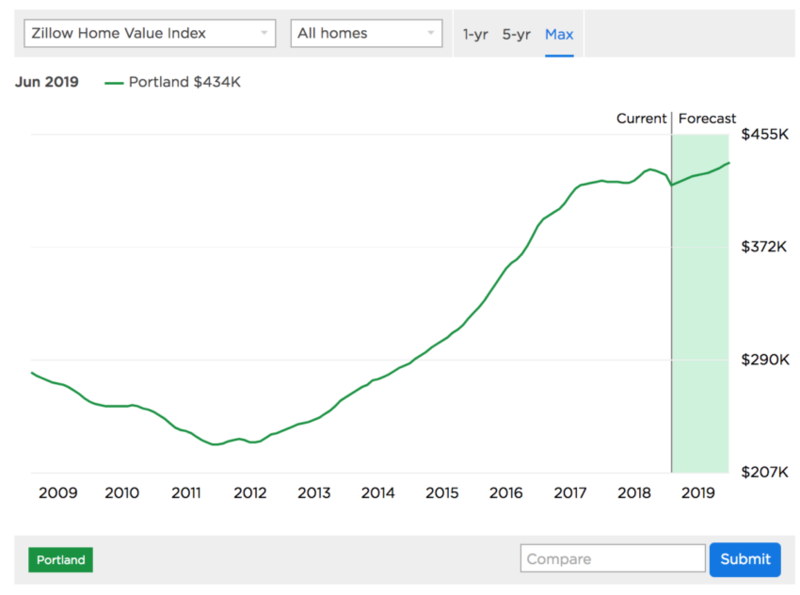 The PERS consultants, the Wall Street banks and investment houses that manage the money, and – way off in the future – Oregon taxpayers who will someday be able to use the endowment earnings to pay retirees, leaving more money for public services and/or lower taxes. Of course those future taxpayers will in all likelihood be richer and more numerous than we are today – so why does PERS think we should suffer for their benefit? New info on likely legislative changes and how to best react, on his PERS Info blog here. And the best explanation I’ve read yet on the kicker and how it turns good news into bad news. Legislative update on Education and PERS bills. Time to panic? From OSU’s Jock Mills. Sorry, I meant to post this a while back. OSU also has a helpful page on whether or not you should panic over the proposed PERS reforms here. Also check Mr. Fearless here and the Legislative site on SB 650 here. Rumor has it that some departments are already seeing retirements. As the Oregon legislature nears the halfway point in the 2017 session, the next two weeks will be among its busiest. Friday, April 7th marked the last day for posting committee work sessions for bills in their chambers of origin, meaning that if a House bill hadn’t been listed on a House committee agenda for consideration, that bill can be considered “dead.” Same for Senate bills in Senate committees. Now the committees have until April 18th to actually pass the bills they have posted. So, for the next two weeks committee agendas are packed with bills vying for survival, while advocates of all stripes are working hard to keep them alive or kill them. A good number of the bills up for consideration over the next two weeks may make it out of their committees, only to find themselves in another committee not subject to legislative deadlines. For example, bills that are a priority—but which contain controversial provisions that need more work— may end up in the Senate or House Rules Committee. Once there, those bills may sit and wait for consideration as part of the overall legislative log-rolling process. Other bills that have a fiscal impact because they require state funding to be implemented will find themselves in the Joint Ways & Means Committee. That committee will generally not consider individual bills until after it has completed work on agency budgets. In many cases bills can be folded in to agency spending bills. That process will continue for the next several months. The legislature has until July 10th to complete its work. And, it will likely not be able to adjourn until it has coordinated and completed work on a patchwork of “mega issues,” including revenue reform; a transportation package; PERS reform; health care reform, including a health provider tax; housing affordability; and a balanced budget that will include a number of cost reductions needed to achieve that budget. Over the last six weeks legislative committees and task forces, some of them in open forums, others in closed-door work groups, have been developing proposals for many of these issues. In the coming months, all of these issues must come together in a manner that will attract the necessary votes to gain passage. For votes involving tax increases, a three-fifths bipartisan supermajority will be needed in each of the chambers. Concessions made in one package may require adjustments in another. The process is one large, simultaneous equation with multiple unsolved variables. In the end, all of the pieces need to fit together. Compounding the mega issues are a number of other discrete policy issues that may increase friction between the two parties as well as between the two chambers. Differences of opinion between chambers can sometimes be as fractious and disruptive as differences between parties. The good news so far is that “The Oregon Way” has not yet involved “nuclear options” or filibusters. But we have miles yet to travel and significant obstacles to overcome before the session is complete. Budget Hearings: This week the Joint Ways & Means Education Subcommittee begins to hear directly from universities regarding their operating budgets. For the past several weeks the subcommittee has heard from the Higher Education Coordinating Commission and community colleges. OSU President Ed Ray will lead off the presentations this Wednesday, April 12th, joined by panelists from the other four-year universities. On Thursday, April 13th leaders from the three OSU Statewide Public Service Programs – Extension, Agricultural Experiment Station, and Forest Research Laboratory will discuss their budgets. Cindy Sagers, OSU vice president for research and OSU Engineering student, Bret Lorimore, will also address the subcommittee on the importance of university research. Support at least a $100 million increase for Oregon’s public universities to achieve a comparable level of funding to the current biennium and to avoid unaffordable tuition increases and program reductions. Recover $9.4 million in budget reductions to the OSU Statewide Public Service Programs–the Extension Service, Agricultural Experiment Station, and Forest Research Laboratory. See comprehensive information regarding the advocacy effort aimed at Senate Bill 805 for the OSU Statewides here. Fully fund the Oregon Opportunity Grant–the state’s need-based student financial aid program for community college and university students. Capital Projects: The Ways & Means Capital Construction Committee has yet to meet to consider the many anticipated bonding projects for the 2017 session. Higher education projects under consideration in that committee include a consolidated list of projects recommended by the seven university presidents totaling $284 million across all seven public universities. Included in that list is $65 million for capital renewal to be shared among the seven campuses; $9 million in bonds matched by $9 million in philanthropic donations for a quality food and beverage initiative at OSU focusing on cheese, wine and beer; $20 million for site preparation and infrastructure improvements at the OSU-Cascades campus in Bend; and a number of deferred maintenance projects. Once the $284 million multi-university package is attained, OSU is also seeking an additional $49 million for OSU-Cascades to complete two additional buildings–an academic building and a student services building. 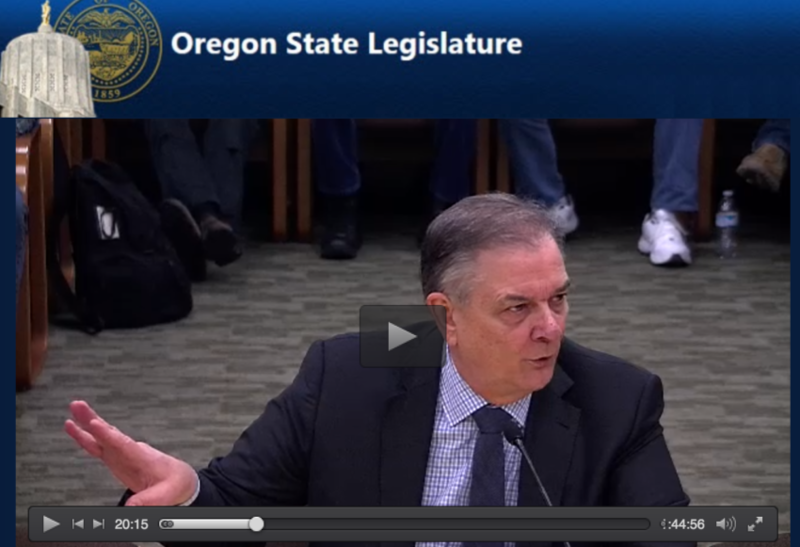 In March, the House Higher Education Committee approved HB2782 which would provide the $69.5 million needed to fully fund the OSU-Cascades campus expansion. That bill is now awaiting consideration in the Joint Ways & Means Committee. Vaccines for Outbreaks (HB 3276). OSU is working with the seven public universities and Rep. Nancy Nathanson (D-Eugene) on a bill that would ensure that vaccines are made available to students and others during major outbreaks of contagious diseases such as meningitis. The bill is undergoing a number of amendments and will be considered by the House Health Care Committee on Wednesday, April 12th. State match for the Pacific Marine Energy Center (SB 285). On Monday, April 10th, the Senate Environment and Natural Resources Committee will consider SB 285 which would provide $4 million in state funds to help match a $40 million US Department of Energy grant for which OSU successfully competed in 2014. OSU is also working to raise private industry and philanthropic funds for this project. For more information on the grant, click here. University Research “Fighting Fund” (HB 2582). This bill would establish a $20 million fund to support universities as they compete for federal grants. The bill is scheduled for a work session on Thursday, April 13th, when the House Higher Education Committee will consider an amendment that will establish the fund but provide the legislature with greater flexibility in determining when and how to transfer revenues into the fund. If adopted, the amended bill would establish a process by which, during the February short sessions, the legislature will consider adding $5 million to the fund over the next four biennia. The goal would be to maintain the fund at the $20 million level as universities succeed in achieving federal grants. Resolution commending the OSU Women’s Basketball team (SCR 17). On Wednesday, April 12th the Senate Rules Committee will consider SCR 17 which commends the achievements during the 2015-16 season when the OSU women went to the final four in the NCAA tournament. The Committee will consider amendments to the resolution that add the team’s accomplishments during the 2016-17 season. Animal Trafficking (HB 2576). This bill contains technical changes to Ballot Measure 100, passed by voters last November. The ballot measure restricts the sale and trade of endangered species and parts and products from identified endangered species. As amended by the House Agriculture and Natural Resources Committee, the bill clarifies exemptions in the ballot measure to ensure that universities and community colleges in Oregon can continue to routinely improve their collections for educational and research purposes through sales, trades, exchanges, and purchases of specimens. The bill was amended and approved by the House Committee on March 23rd, and on April 3rd the House approved the bill by a vote of 58-0. The bill is now in the Senate where it will be considered by the Senate Environment and Natural Resources Committee. Open Education Resources (HB 2729). On March 28th, the House Higher Education Committee amended and approved HB 2729, which would continue funding for open education resources, also known as OERs or “free textbooks.” The bill is now under the consideration of the Joint Ways & Means Committee. PERS benefits for Post-Docs (SB 214). Because post-doctoral research positions typically do not last five years, few, if any, post-doctoral scholars fully vest in PERS or ORP. This bill would enable an alternative retirement program for post-docs at public universities to ensure that they can transfer their benefits when they move on to another employer. The bill will be considered by the Senate Workforce Committee on Monday, April 10th. For a fact sheet that explains the bill click here. OSU will be providing additional information regarding the overall issue of PERS reform bills later this week. Please consider joining advocates in support of Oregon State University on Thursday, April 20th for OSU Day at the Capitol. For information about the activities planned for the day: click here. Analysis from the State Legislative analysts, here. Saul Hubbard has the sad news in the RG here, along with a list of the current top 100. 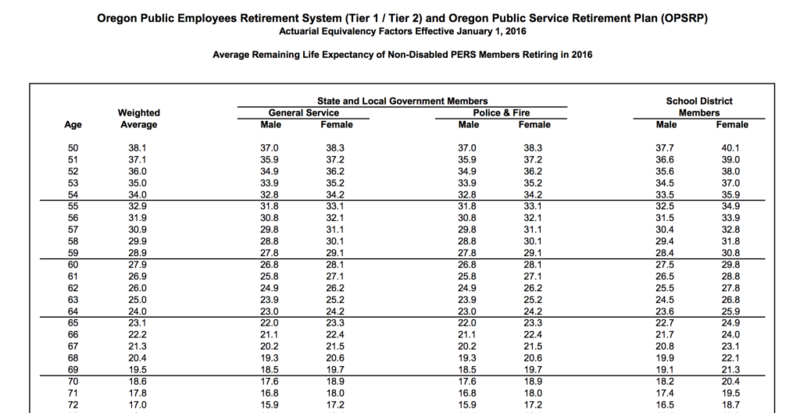 As Sickinger explained, a large part of the amount that state agencies (and UO) must pay for PERS isn’t going into investments that will support retirement costs for current workers, it’s going to pay current retirees, because the state agencies didn’t put in enough back when those retirees were working. The latest calculations by the PERS actuary, released last week, showed that Oregon public agencies will have to shoulder an additional $885 million in pension costs in the 2017-19 biennium, a 44 percent increase. Part of that increase was expected after the Oregon Supreme Court threw out some cost-curbing PERS changes in mid-2015. 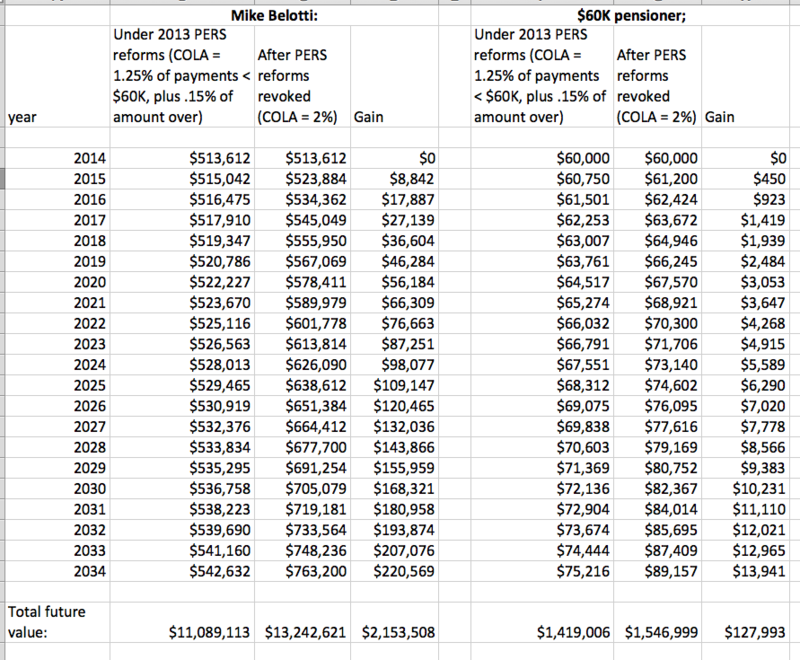 Those changes included a reduction in PERS cost-of-living increases, particularly on large pensions. Just don’t make the mistake of counting those costs as a benefit to current workers, as VPFA Jamie Moffitt does. In the example used for Money Match members, the setback appears to be approximately 5 months. That means that the benefit you receive on December 1, 2015 (if you are eligible to retire), won’t be the same again unless you continue working until May 1, 2016. This is one of the longest setbacks in recent history. Many people will wonder what to do. My answer is that if you were not planning to retire in the next six months, it probably makes no difference. Ted Sickinger has the report in the Oregonian, here. This will start in 2017. I’m no actuary, but the combination of lower assumed earnings and longer assumed life expectancies will mean a decrease in the monthly payout from the PERS annuity you get when you retire. At the same time lower assumed earnings will mean that employers will need to pay in more to keep the PERS books balanced, and longer assumed life expectancies will mean employers will have to pay in more to cover the expected costs of the annuities of past retirees. A statement like this would be transparently false, but given that there’s still no retraction of the most recent “Around the O” post on benefits and the UO Senate White Paper goals, it would be in keeping with past UO statements. One way that UO might consider saving money would be to revise the current Tenure Reduction Program, to encourage higher paid senior faculty to retire, so they can be replaced with cheaper, younger ones. The current TRP is not a very good deal for faculty, and since it is not aimed at faculty on the margin of retiring or continuing to work, it is not an effective program from the cost side either. Good PERS returns to reduce faculty subsidy for Bellotti’s pension? Good news on PERS. High investment earnings and Kitzhaber’s cuts mean that it’s now 87% funded. I think that’s the best of any state pension fund. Ted Sickinger has the report, here. But let’s face it, no one reads this blog for the good news. And the bad news is that UO is still on the hook for the unfunded pension liability of people like former football coach Mike Bellotti. Sickinger’s investigative piece on how UO’s decision to funnel Bellotti’s Nike money through UO boosted the pension for him and his wife former wife wife to ~$500K a year, and how we have to pay for it, is here. The other good news? 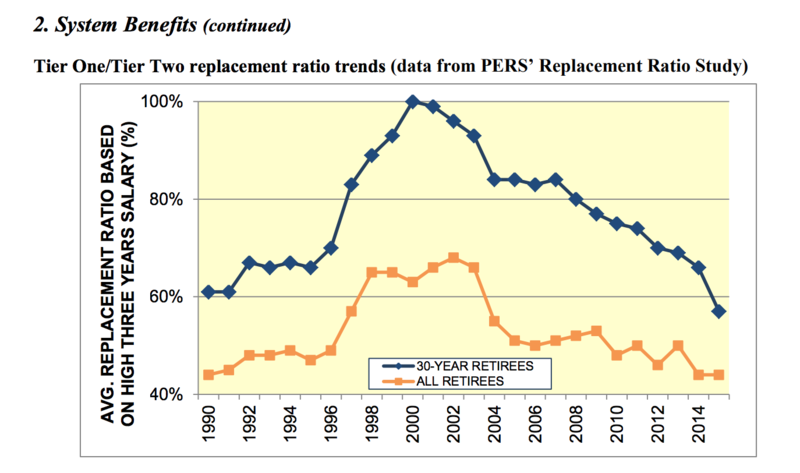 If you are pre-1995 Tier 1 faculty and opted into the ORP plan in 1996, (typically TIAA-CREF) UO’s contribution rate to your account is determined in part by the need to pay PERS the unfunded liability for the payouts to Bellotti and his ilk. The more Bellotti gets, the more UO has to pay PERS, and the more they have to pay into your retirement account. And if you are not Tier 1, or stayed in PERS, you don’t need to worry much about further cuts. The ugly? UO’s PERS costs are set for the next 2 years, and VPFA Jamie Moffitt will likely use the fact that UO still has to pay for Bellotti in the next round of union negotiations – which will start in December – to argue that faculty are overpaid and that UO can’t afford more merit and equity money, just as she did last time. The probability that these rates will soon fall has increased, but I’m guessing if the union presses that point, Moffitt will choke and leave the room, just as she did last time.